Because the Illinois race and Iowa race were literally across the river from each other, we were able to stay in the same hotel for two nights. This meant we could spend our day after the race checking out the local area, rather than doing much driving. Know what was in the local area? 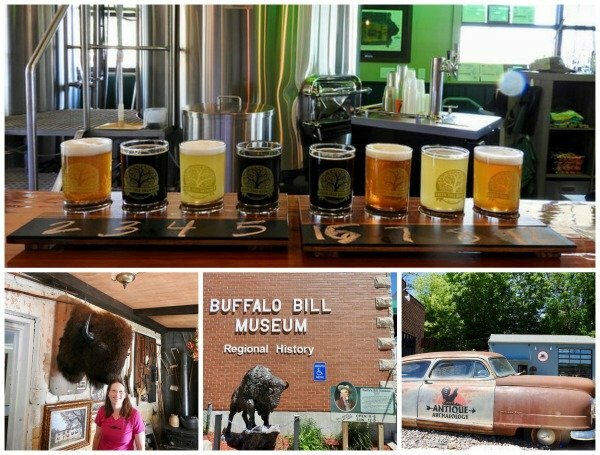 The shop from American Pickers and a brewpub, as well as the Buffalo Bill museum. 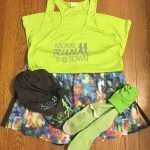 Our final race of the series was going to be followed by an 8 hour drive as we needed to head to Annapolis for the ZOOMA half marathon. 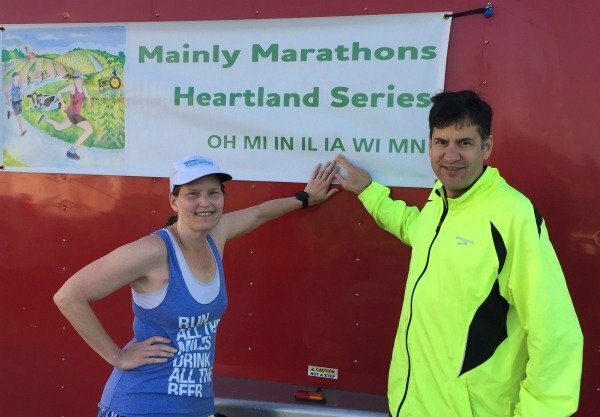 In order to buy us some extra time, I decided to take the early start that Mainly Marathons offers to half marathon, marathon, and 50K runners. This meant a 2:30am wakeup call. Good thing my body was still on Eastern time, so it only felt like 3:30am. OK, it still sucked. 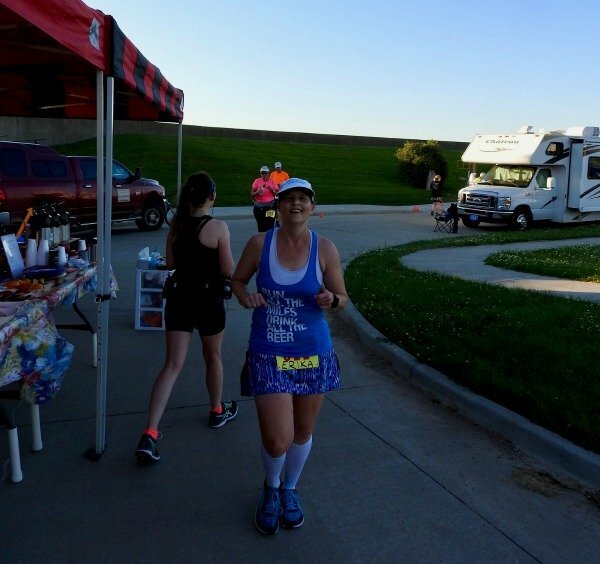 We got to the race with plenty of time to spare and I headed out on the first of 6 laps wearing a headlamp. 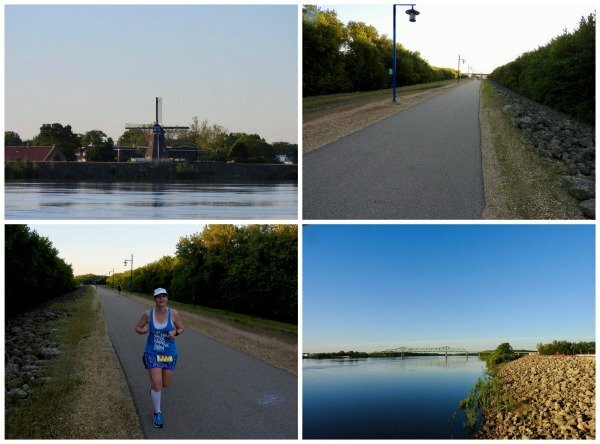 This route was along the west bank of the Mississippi River, across from the previous day’s race. Unlike the previous days, it was mostly flat and easy. 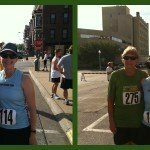 I planned to run slowly and enjoy the race, since I really hadn’t trained to run 3 races (plus a 5K) in a row. Instead, I felt amazing and ran my 2nd fastest race of the series. The views were awesome and by this point in the series, I knew pretty much everyone, so it was just a fun, social time. My splits were pretty even and I was done running before it got warm. 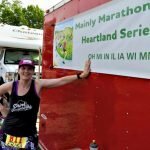 Heartland Series complete! The weather was beautiful and the views were lovely. I love this tank from Sarah Marie Designs. I felt better than I really had any right to. The only bad was that this was my last race of the Series. I hate it when I’m done and have to leave. 8 hours in the car after running a half marathon. I’m linking up with HoHo, Tricia, and Zenaida for the Weekly Recap. Stop by and check out their blogs and then check out a few in the linkup! Thanks! I think I’ll be stuck here for a while LOL. I know a 2:30 wake up call isn’t fun, but it’s nice the series offers an early start. I’d do it to be done before it got warm too. It’s absolutely amazing how you do these races on back-to-back days! It sounds like you had a great time, too! I wish I could have swung over and cheered you on. You look so happy! These races look like a lot of fun. 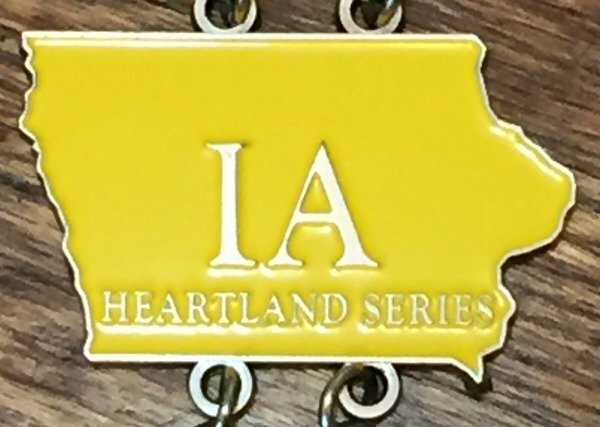 Did you find any good Iowa beers? 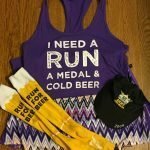 I NEEEEED A TANK WHICH SAYS THAT….EXCEPT 🙂 walk the miles and drink the diet coke. So apparently I need a different tank. Congrats on state #38! Ugh, 2:30 am wakeup call is not fun at all but at least you were done by the time it got hot. This series does look like a lot of fun! The early start …not so much. But hey, if it gets you done before the blazing heat …I’m all for it too! Are all the race courses in this race series made up of laps? 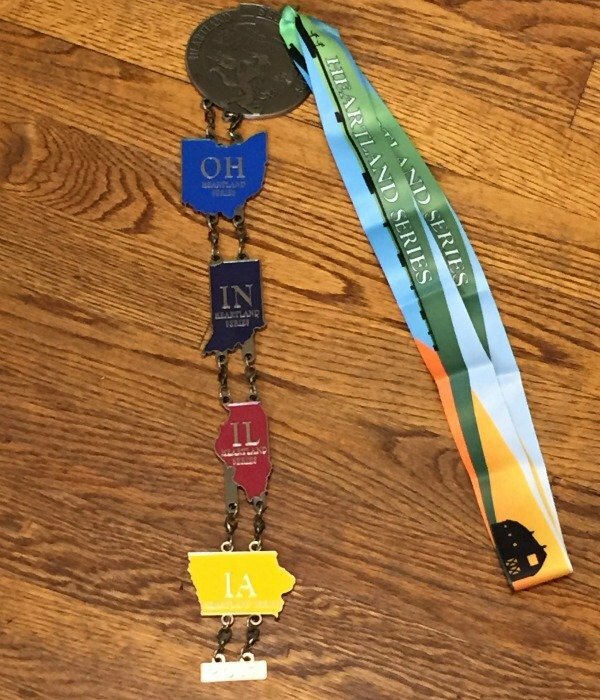 I love the way they just add another ‘state’ medal to your existing medal …pretty neat! 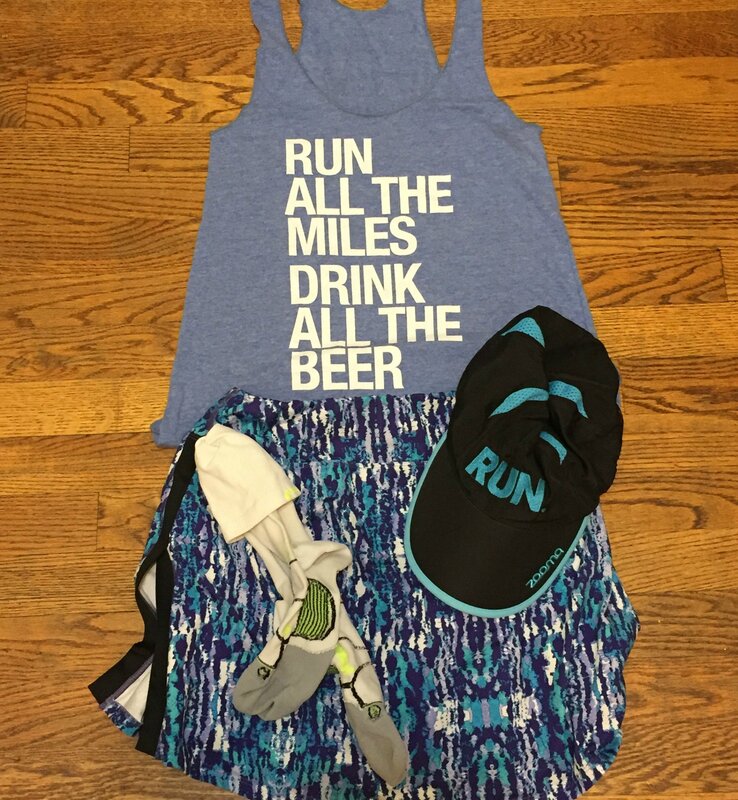 That tank is perfect for you! Congrats on getting another state down. 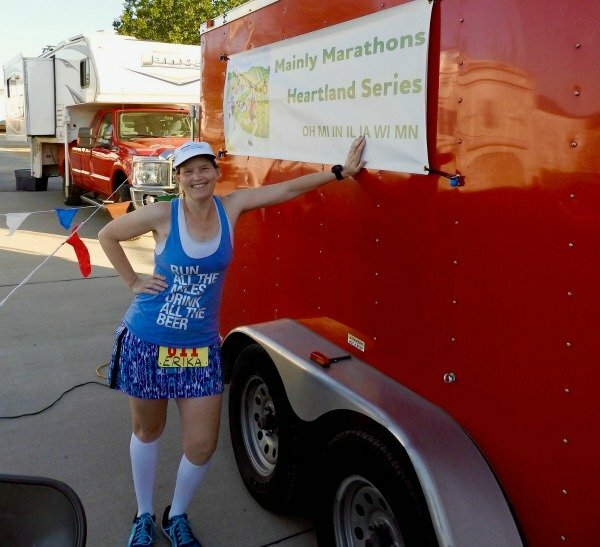 So, these mainly marathon races, do they hold races in each state? It looks like lovely views, but you lost me at 6 laps, LOL!